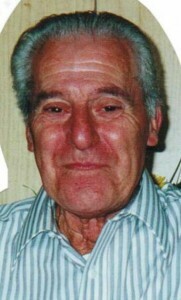 Albert “Bob” Denardi, 83, of Warren Pa, died Friday morning, January 6, 2012 in his residence. Bob was born in Warren on January 19, 1928 to the late John and Lucy Vasame Denardi. He retired from Deluxe Metal in 1990 after 42 years of service and was a member of American Legion Post 135. He served in the U.S. Navy in 1944 and the U.S. Army during the Korean Conflict. He has a member of St. Joseph R.C. Church. Bob was a passionate golfer and Notre Dame fan. Bob is survived by his wife of 51 years, Janet Wells Denardi, whom he married June 25, 1960 in St. Joseph R.C. Church; three daughters and a son in law – Jean Denardi of Warren, Mary Pickens of Erie, Pa, and Carol and Allen Rosborough of Irvine, Pa; three grandchildren – Amber Pickens and Seth Pickens, both of Erie and Connor Rosborough of Irvine; a great granddaughter – Olivia Easter of Erie; a sister – Mary Walker of Clarendon, Pa; a brother – Frank Denardi of Warren; a Godchild – Diane Finley of Clarendon; and several nieces and nephews. He was preceded in death by his sister – Jennie Denardi; three brothers – Charles, Nick, and Sam Denardi. My deepest sympathy goes out to you and your family on the passing of Bob. My thoughts and prayers are for you at this time of sorrow. You have our sincere heartfelt condolences for your loss. Bob was fantastic man and I was very proud to have such a wonderful Uncle. We will miss him deeply but will have him in our hearts for an eternity. Our thoughts and prayers are with the entire family. Dear Janet, Jeanne, Mary and Carol. You know we are with you in spirit. Bob was a great person who always warmly welcomed us on our visits to Warren…just remember, memories are forever..